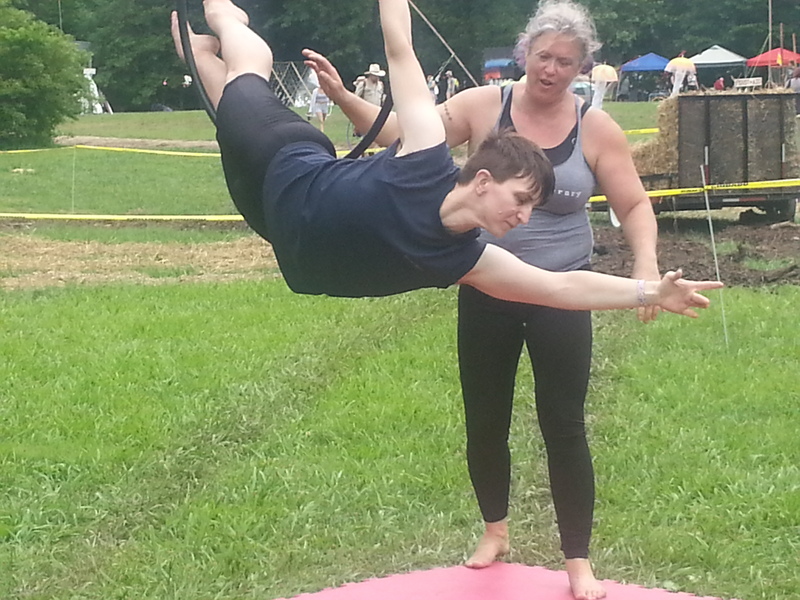 I got Iron Cross on the silks this weekend, so now I’m all about doing it all the darn time, because, quite frankly, I didn’t expect to be able to pwn iron cross this early in the game. The smaller image gives you a sense of the lines from the side. I didn’t want to just steal someone’s actual photo and couldn’t find any public domain ones, so I hope this quick sketch gives you the basic idea. 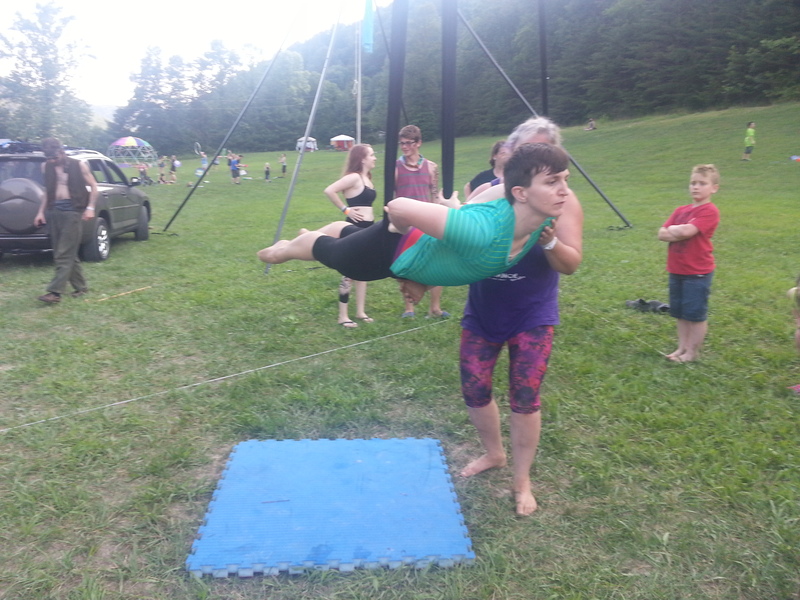 It looks fabulous on silks or trapeze — I think it’s harder to “get” on trapeze, but once you know how to do it (and have sufficient strength), it feels very doable on either. Today I tried it on trap again and was able to do it well. I’ll have to see if I can get a picture tonight. *Not really. Please seek qualified instruction before attempting this yourself. Or, of course, firefighters of your preferred gender. This clip is really short; I’ll ask Denis to try to get a longer one next time! Today was Shiny Tights Day … At least, it was for me. Candlestick in a straddle with no feets. No big deal. 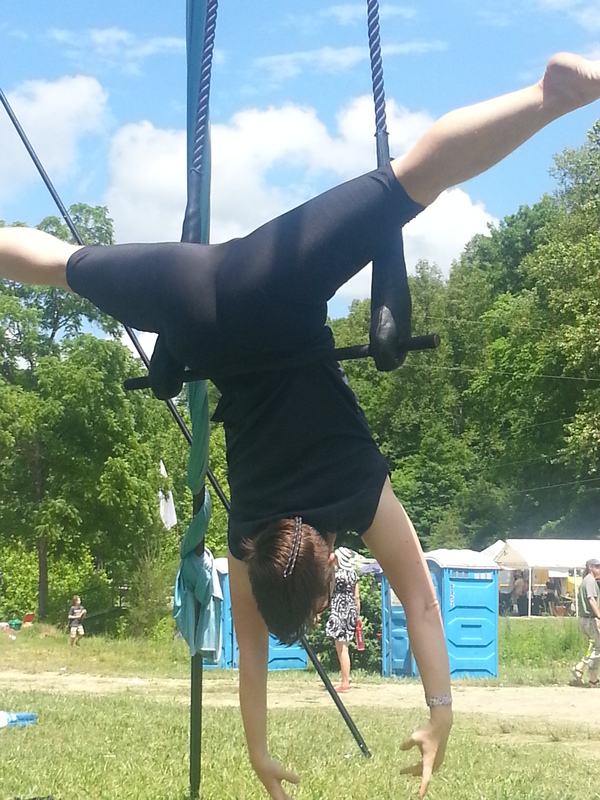 A little Archer’s Pose (this was actually part of the dismount). “Squatty hip lean,” and probably the nicest picture of me going. Also, I haz a pasty. Wow. Finally flying Denis in foot-bird! 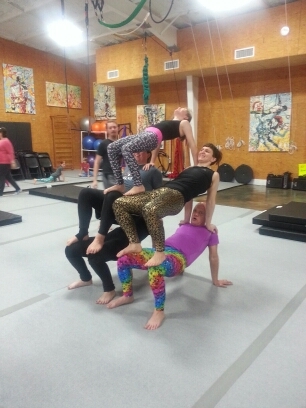 The highlight of acro-balancing, in which we built a mighty wall of tabletops. 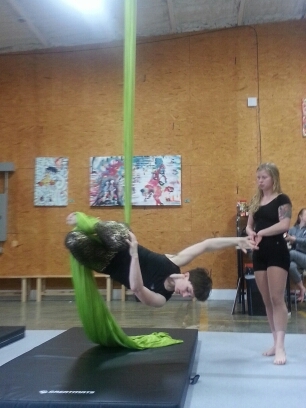 Today, we took our first class at Suspend — their “Cirque Sampler” offering, which lets you try things out (we focused on silks and trapeze). 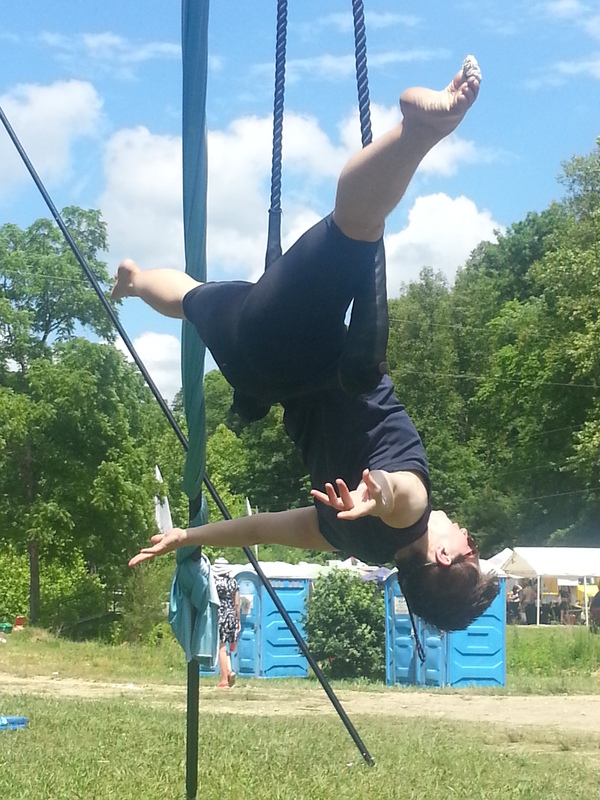 Yeah, I sort of don’t have any new pictures of aerial stuff, so please enjoy this blast from the past. 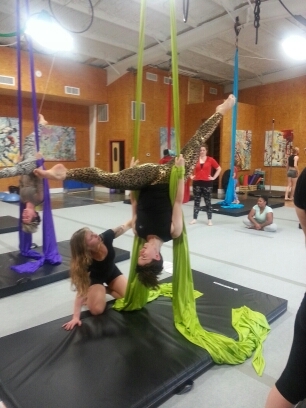 intuitive — but not so much that it makes you entirely equipped to pwn the silks right out of the gate. Works out about the same on trapeze. In short, today’s lesson essentially confirmed my worst fears about my core- and upper-body strength (or lack thereof): or, well, maybe not confirmed them, but indicated that they weren’t entirely out of line with reality. So, while I was intuitively able to do graceful things on the silks and the trap, I was not able to climb the silks (or, well, I could climb onto the silks, and that was it) or to hold the extended chair position for any length of time, and my straddle dismount on both silks and trap was somewhat uncontrolled, though not as bad as it might have been. Yeah, this one’s not just recycled, it’s re-recycled. You’re welcome, Planet Earth. Basically, in terms of climbing and core strength, I got schooled by the hubster. Conveniently, however, the muscles that need to get stronger for aerials are the same ones that need to get stronger for ballet, particularly if I want to venture into partnering someday (which I very much do). Also conveniently, we were able to convert our 10-class card (and $25) into two intro-unlimited-classes-per-month plans — one for each of us for the next month, starting Tuesday, and our instructor today said we’re good to go ahead and step into the second class of Intro to Aerials. w00t! 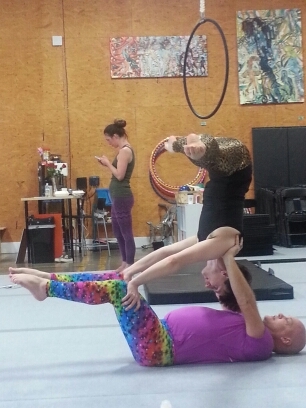 It looks like we’ll be doing aerials and circus arts on a Tuesday-Thursday-Saturday schedule for now, which should nicely complement my Monday-Wednesday-Saturday ballet schedule. I’ll still have two scheduled rest days, unless I pick up a Friday class somewhere, which depends on a number of factors. I do not want to overdo it. 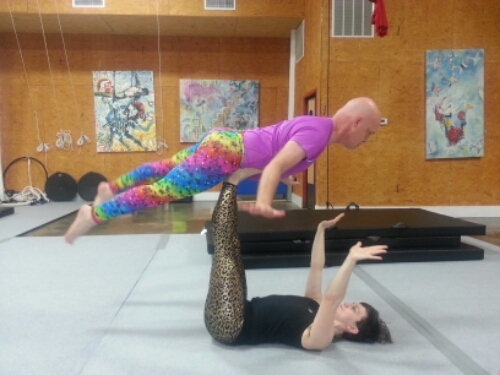 Tuesday we’re doing Intro Aerials and Thursay we’ll try Acro Balancing, which looks fun. I’ve done a bit of that as a function of gymnastics training when I was younger. Next Saturday, we’ll be trying juggling after Advanced class, so that should be interesting. I have never actually really juggled, so my day will encompass both something I do well enough to more or less legitimately take an advanced class and something in which I am a complete and unregenerate novice*. *I realize that “unregenerate novice” doesn’t actually make a whole lot of sense, but gosh darnit, it sounds good, and because I also write poetry, I am just going to claim poetic license here and go with it. So that’s our first day of life as Official Cirque N00bs. In other news, I just realized that the grad school application I need to knock out this month needs a 7 – 10 minute audition video, so if I disappear off the etherwaves for a bit, my apologies. Between that, ballet, aerials, and a job I’m in the middle of applying for (for which I’m now in “doing evaluations and preparing for 2nd interview” phase), I don’t expect to come up for air again until the 16th. Ballet class notes, however, might continue apace, primarily because I ride the bus back from ballet class, which gives me time to do that. I’m having a random tough week. The fact that I slept for fourteen hours last night and keep wheezing makes me think I’m coming down with something. That said, it’s been quite a while (by my standards, anyway) since I’ve been sick enough to be more than a nuisance, so I guess that’s something positive. Anyway, I may drop off the radar for a bit while I’m trying to get over whatever this thing is, for which I apologize. I hope to be back soon with the first installment in my my much-promised and much-procrastinated-over Cooking With ADHD series. Sometimes the Universe steps in and reminds us where we’re supposed to be going. This meshes nicely with last week’s (umptillionth) heretofore-unannounced revision to my long-term plan, in which I first discovered that one does not necessarily have to effectively complete a second master’s if one first completes a stand-alone master’s program and then goes for a doctorate, then decided that maybe doing a DMT Master’s (or a counseling or clinical psych Master’s with concurrent DMT cert) first would be a good idea after all, rather than diving directly into a doctoral program and attempting to do the alternate-route certification concurrently. PlayThink was yet another reminder of the things that make DMT such an ideal fit for me: I love moving; I love helping other people connect with themselves through movement; I don’t want to sit behind a desk; I don’t want to have to wear normal clothes (seriously, if you’re choosing a career path, that’s something worth thinking about: Do I want to spend my entire day in khakis and a tie, or in lycra? As much as I like getting dolled up in a sharp suit, I’m happiest in dancewear). There’s another point, though, that I didn’t quite get until this morning. I’m going to take the long way ’round to explain it, because words. Last night, I was pondering and feeling strange about an experience I had at PlayThink; about how a guy (Brandon, if I didn’t hear him wrong) who I barely knew embraced me and just held me for a long moment with a singular intensity and, strangely enough, it didn’t freak me out (that was the part I felt strange about — the not-freaking-out part). I’m still, generally speaking, quite protective of my own body, but for whatever reason, in that particular moment, I was able to just let go and experience and enjoy that physical connection, that closeness (for which, if you ever happen to stumble across this blog, thank you, Brandon!). I laughed, then, because he was right: I really struggle to explain anything (even my blog posts get a lot of revision, most of the time), especially abstract concepts. Feelings are the hardest. I have trouble figuring out how to describe them using the abstract vocabulary of emotion — but I can dance about them … and, oddly enough, often moving my body helps me figure out which words to use. Moreover, moving with people makes me feel connected to and comfortable with them in ways that nothing else does. The sense of instantaneous trust I felt towards Brandon resulted at least in part from our participating together in an activity that involved movement, cooperation, and spontaneity. It reminds me of nothing so much as the first group improvisation warmup that we did in Linnie Diehl’s Intro to Dance-Movement Therapy intensive last November at the ADTA conference! I suspect that connection, that sense of trust that stems from moving together, may be one of the greatest tools that DMT can offer. For those of us who struggle with language and for those of us who struggle with trust, there’s a profound potential there. That trust is a sacred one. 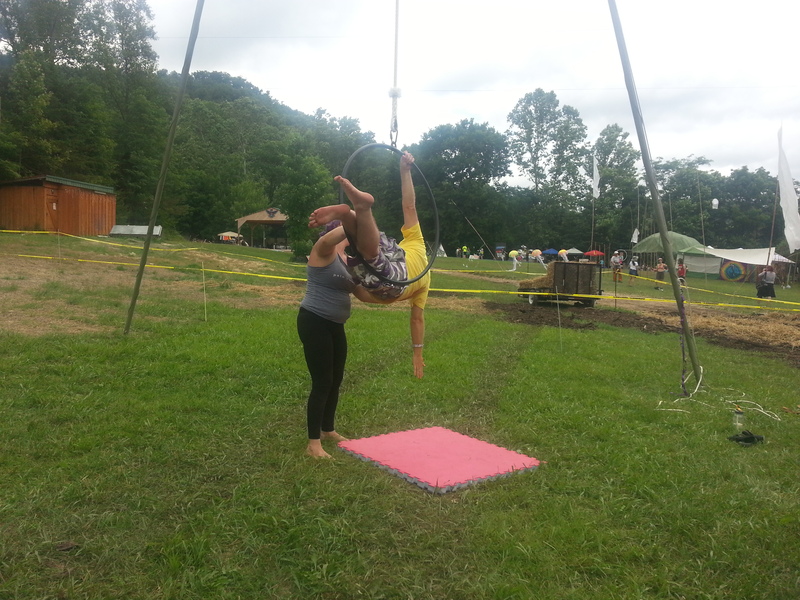 In a way, that same sacred trust suffeses the work of dancers, of aerial artists, of acrobats. There’s a connection that runs deeper than words that we can find when we move together. It all sounds very mystical, but even mystical experiences occur in the realm of neuroscience (and, in fact, the domain of the liminal, mystical mind is one in which neuroscience as a field is very interested!). I don’t know, yet, precisely where my journey is taking me, but that is ground I very much hope to explore: first, in the experiential sense, connecting with other dancers, with other artists, and someday with other DMTs and with DMT clients; second, in the scientific sense, trying to understand how our experience of that physical, movement-based connection which bypasses words takes place on a neurobiological level. DMT as a modality is a good one for me to practice because it takes advantage of my own native language: I’m a physical being first and a cerebral one second, and that’s okay. I realize that this is a huge part of why I am much more confident and social in the ballet studio; why I felt so confident and social at the 2014 ADTA conference; why, at the end of PlayThink this year, I didn’t hesitate when more than one near-stranger bypassed my proferred handshake and went in for a hug. As for the present tense: maybe I’ll stop trying to describe my experience with Brandon and, instead, I’ll try to dance about it. 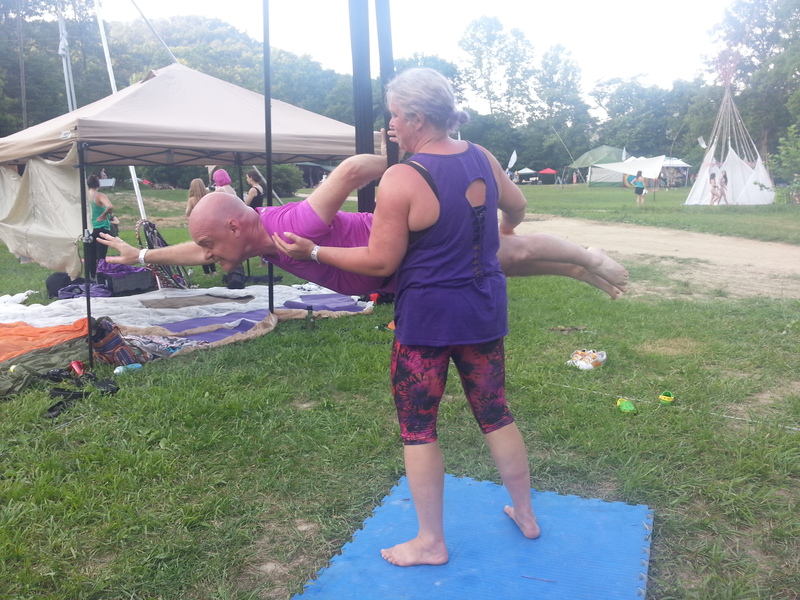 Last Wednesday, I wrote out my usual class notes but never got around to posting them because we jetted off to PlayThink Movement and Flow Arts festival right after class. To summarize: I made it through all of class last Wednesday; mostly kept my proverbial waterfowls in a linear array during barre; managed some rather nice center adagio; did rather well going across the floor to the right and somehow lost the combo going left (qv: threw in an en dedans turn where there should have been an en dehors turn and my brain clicked on and proceeded to hose me up completely — I repeat: THERE IS NO THINKING IN BALLET); nailed some entrechats quatres; and didn’t get the medium allegro combination down (in case you’re wondering: when you’re tired, it’s a good idea to mark the combo, because your brain alone might not catch it). While we were in Florida, I did a lot of tendus, frappes, and degages in the water, as well as some grand battement. That made a big difference to my speed during petit and medium allegro last week. It would be awesome to have regular access to a pool in order to work on that stuff! 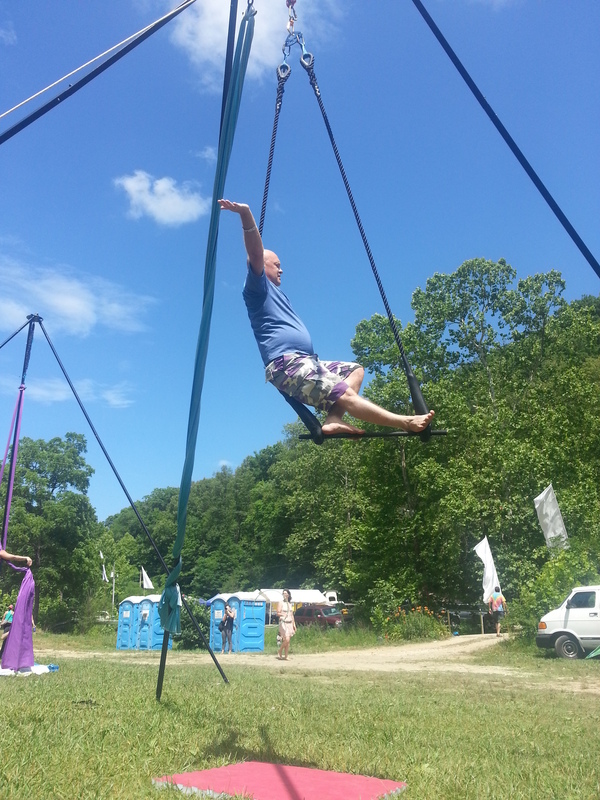 At PlayThink, my goal was to gain some more exposure to aerial apparatus. Terri and Cindy from Turners were back again this year, and they’re both great teachers (Terri, in particular, reminds me of Brienne :D). 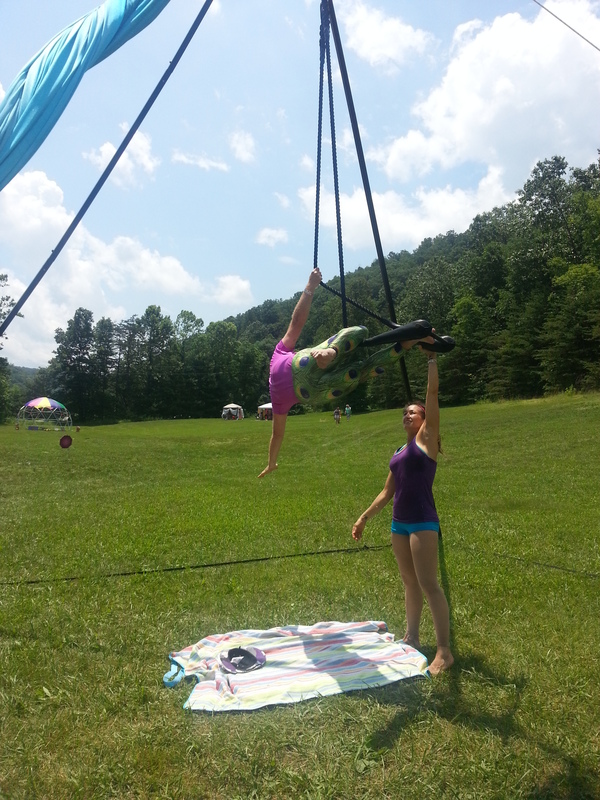 Cindy led a great aerial hammock class. Here, she’s showing me how to get into a forward balance (once you get to this point you take your hands off the hammock; I don’t have a picture of that, though). I didn’t get pictures of the coolest parts, since Denis was in the other group on one of the other rigs at the same time. I need to practice this one more. I tend to set up too low. Terri got me sorted, leading to this rather lovely moment. Denis is more nervous on the trapeze than I am, but he still got both hands off the ropes. The trapeze was set about 2 meters up during our second session, and I wasn’t sure I’d be able to get up there, but it turned out to be very doable. 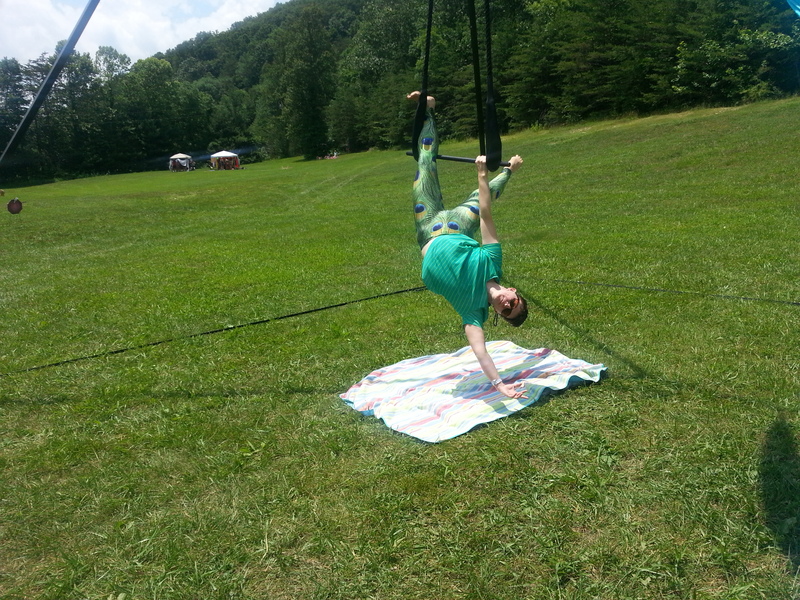 Of all the apparatus, I think I enjoyed the hammock most (which, by extension, probably means I’d also really love silks; we missed the intro silks class, though, since Denis had to work on Wednesday morning). I’m pretty flexible, and hammock takes advantage of that in a particularly cool way. My lower-core strength is great. 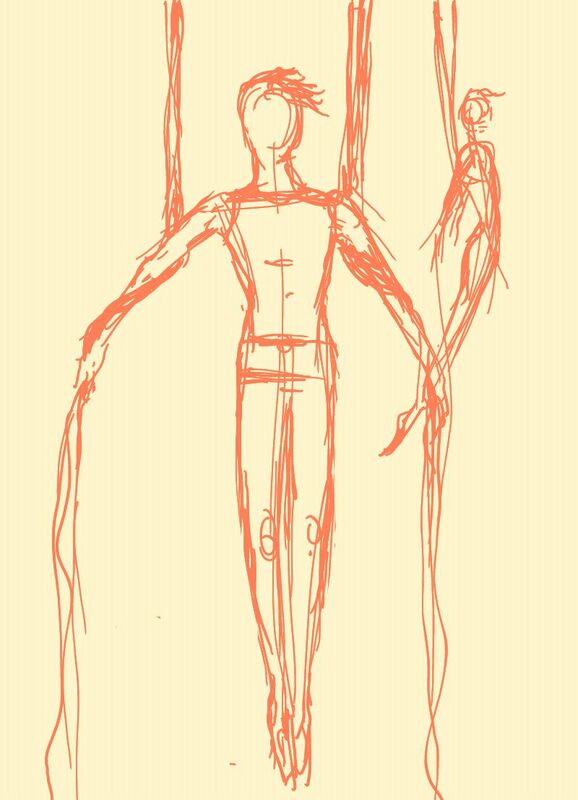 I need to work on the uppermost core muscles, as well as shoulder-girdle and arm strength. I really, really love aerials (this should come as no surprise). I should be more confident about life in general. 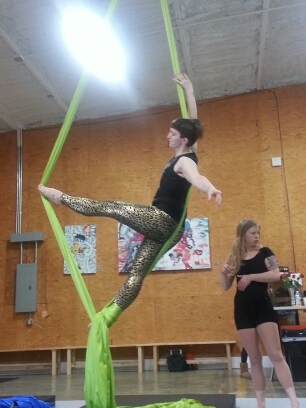 Both Terri and Cindy teach locally, and Terri will be teaching at the new aerial arts studio that’s opening (which is in a really convenient spot and offers a very reasonable price structure), so I’m hoping to add some aerials to my rotation. I think they’ll be pretty compatible with ballet, and the class times won’t conflict.